Certain details concerning hygiene must be highlighted in order to better understand this vital part of the business. It must be clarified that this particular type of fish does not have teeth and therefore it cannot hurt people. However, it should be noted that there is another kind of fish in the market (known as Tilapia or Chin Chin) with similar behavior with the Garra Rufa fish, which does have small teeth and do bite. The fish that we supply are certified ‘Garra Rufa’. The certification is done by the responsible authorities of their exporting country, and moreover the fish undergo a health check upon arrival. This process guarantees the highiest quality of the core business element. Furthermore, according to the most recent scientific research, ichthyotherapy has no side effects to the human health. As it is explicitly stated in the research work of a team of Austrian scientists, this is a totally safe treatment. There are no reported illnesses transferred from one person to another, even when they share the same aquarium. 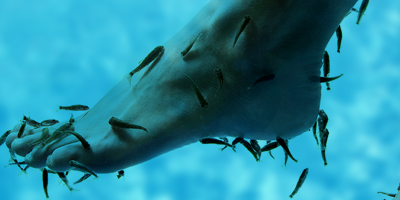 The maintenance of the facility has a direct impact on the hygiene of not only the customer but also of the fish and its wellbeing. For this reason special attention is given for the high quality of the mechanisms and the cleaning of their water; it is not coincidental that the ability to maintain an aquarium is often described as “the art of maintaining good water”. These mechanisms comply with all the hygiene standards, since we have in the same place the coexistence of fish and parts of the human body. To purify the water we use high quality mechanical, chemical and biological filters of European origin, which recycle the water in the aquarium more than 3 times per hour. For the removal of the water bacteria we use a special filter with UV radiation which eliminates 99,9% of them. This way we can ensure the crystal clarity of the water and satisfy the highest hygiene standards. 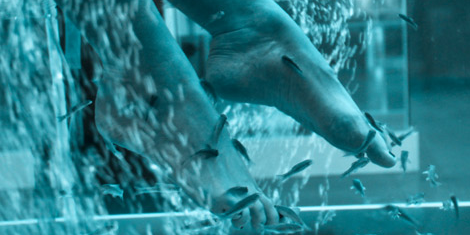 The Health Protection Agency (HPA) and Health Protection Scotland are currently unaware of any cases of infection associated with the use of fish spas pedicures in the UK.